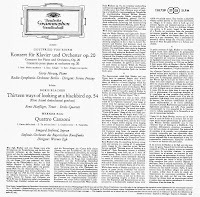 Deutsche Grammophon SLPM 138 759 STEREO 1962 LP/matrices: Jan.1962/Sept.1961. 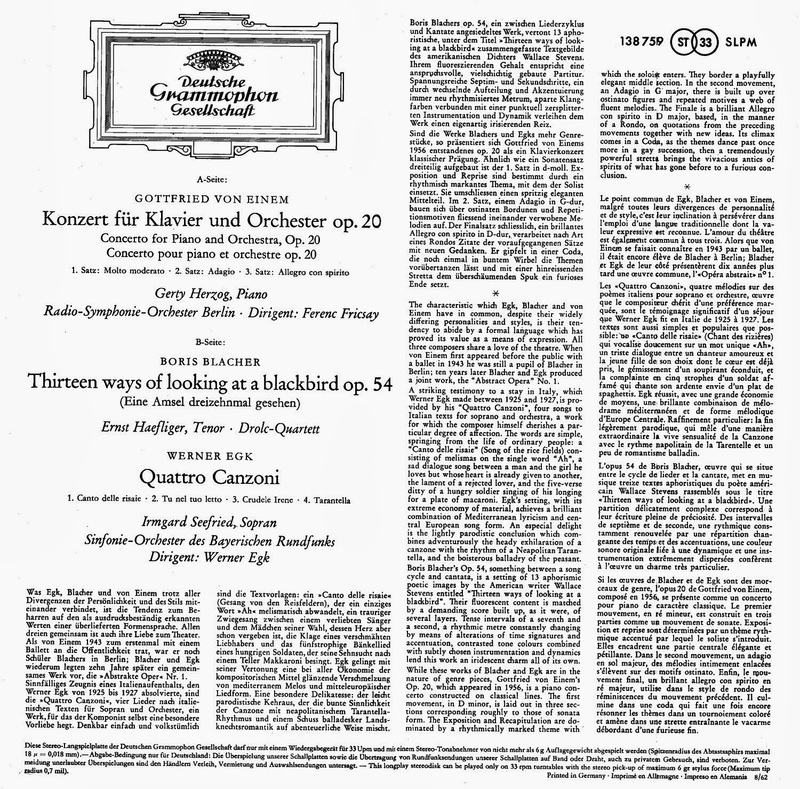 Einem: Recorded: 7 Feb.1961. I see that my comment above 'said it all' - except that I would've included the Einem 'Ballade' on 138 828 - but that was only released in 1963.
unfortunately it has become habit with some 'original cover' reissue box-sets to omit couplings. by coincidence there is another egk (la tentation) which would go with the french suite (fricsay) on 18 401 LPM but is missing in the fricsay box. a different reading of la tentation is on 139 142 SLPM - you have posted the sleevenote of that recording previously - are you planning on a complete transfer of it as well? 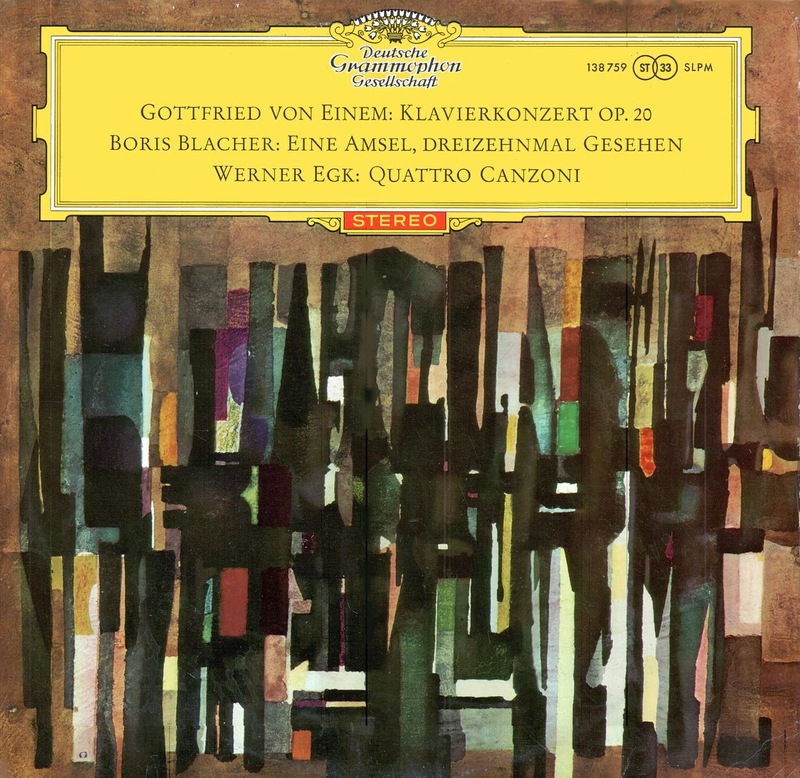 Not being a CD collector, still I thought the Egk/Seefried had a CD issue (possibly coupled with the Egk from 1966: which vintage I don't copy for these blogs). 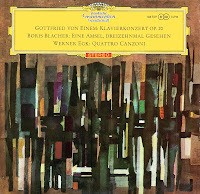 Don't like most early DGG's, for technical reasons, (and this LP wasn't too 'silent'). Only have one of that mono 'Musica Nova' series (quickly deleted) - and it's not that Fricsay/Egk- but Orff's "Die Bernaurerin" (18 408). having missed the bernauerin is much of a grievance! i always wondered why dgg - after the great success of the 'musik- sprache der welt' reissue had not done a same with the musica nova series. would love to have the whole set; speaking of sets: do you still have other recordings from the decca coronation series (lxt 2786-97 as far as i understand) up for posting? ah - you meant that the musica nova series was soon cancelled by dgg; i head misread it and thought that you had previousley uploaded it but deleted the post or that it had been deleted from the hoster because of idleness! tedious: the music or the transfer-effort? since the lpe i have referred to above is a 1st ed, i wondered if you'd say that the discussion on 1st ed. vs. later ed. as with deccas also applies to dgg? The Orff is 'extracts': with a lot of 'speech'. 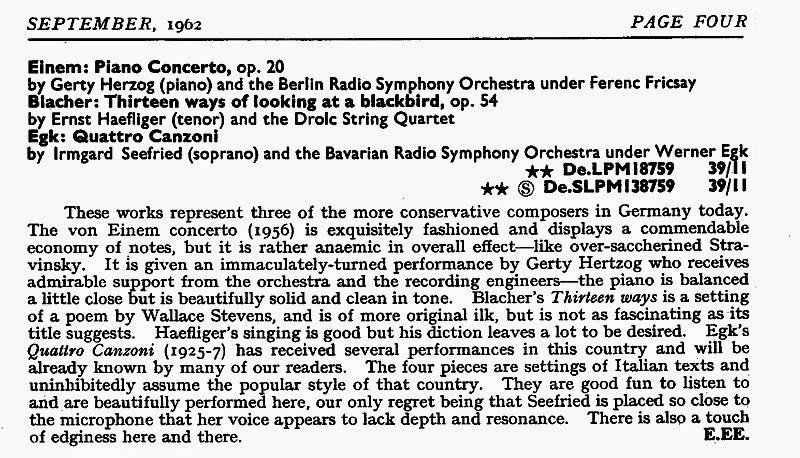 The tape to disc transfer needs lots of treble boost: even if you do that, as with much similar (mono) DGG sound, it still won't equal their post-1961 transfers: thus I can't be bothered (also applies to lots of pre-1970 stereos). LXT: thats why I stated I only have 2 with the red sleeve. Others are on ACL (2786 have on ACL / 2787 (ACL c/w#5) + 1958 LXT recuts / 2788 have original LXT + half on ACL / 2792 is partly on PRISTINE as later LXT5379: have several copies of the blue issue). Those after the RVW-Rubbra I don't have (or want: likely sound abysmal). Have mentioned before I don't have the Falstaff/Warlock ACL - a nuisance. All Hirohito's copies are old matrices (pre-1955)- so good luck to him! AFAIK there wasn't a 'boxed-set'.